Pest description and crop damage Yellowjackets are about 12 mm long, have black bodies with yellow bands and, as compared to paper wasps, are rather stocky and have all-black antennae. Yellowjackets are not direct pests of blueberries, however some years their numbers reach levels high enough that they pose a risk to workers, making harvesting and cultural operations difficult. Yellowjackets are more typically a problem with later-ripening cultivars of blueberry. Biology and life history All the yellowjacket species listed here build paper nests, enclosing tiers of combs. These can be found either aboveground in wall voids, under roof overhangs, abandoned structures, etc., or in paper nests underground. The western yellowjacket is the most common species in the PNW. They, along with the common yellowjacket, almost always build papery nests underground. The aerial yellowjacket builds papery nests both underground and aboveground. The German yellowjacket, an introduced species, builds papery nests either above or below ground. When nests are built in protected areas, like wall voids and attics, unlike other yellowjackets the German yellowjacket may overwinter. Yellowjackets survive the winter as mated females (queens) in protected areas such as in woodpiles, under bark, or in areas of accumulated organic debris; they also attempt to come indoors at this time. In the spring, the females become active, and begin to build nests and lay eggs. As these initial eggs hatch, the queen feeds them with soft-bodied insects that she has killed. Once these mature, they take over nest-building activities and the queen's sole function is egg-laying. 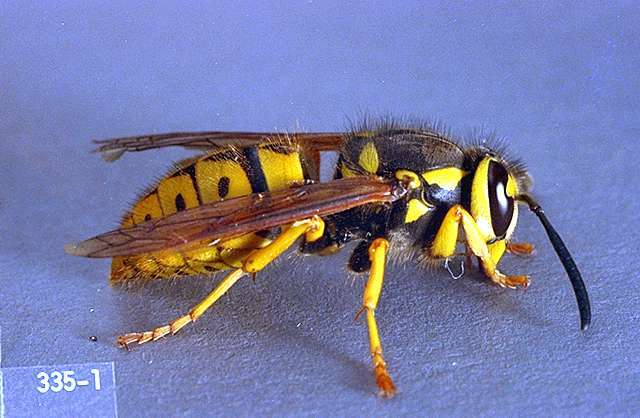 During the spring and early summer, yellowjackets feed primarily on soft-bodied insects, such as caterpillars, grubs and flies or on spiders. As prey become more scarce, yellowjackets seek out protein- and sugar-rich foods, including fruit. Honeydew produced by aphids, scale or other insects is also favored. 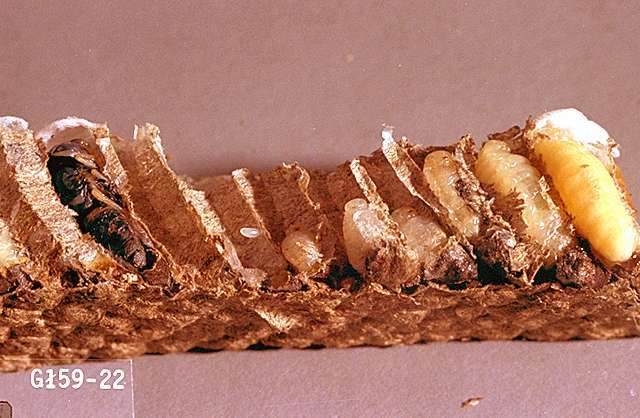 In late summer to early fall, males and new queens are produced; they leave the nest and mate. The first freezes of the season kills all workers in the nest. Only the newly mated queens survive the winter. Nests from one season are never re-used. heptyl butyrate traps-These traps mimic the odor produced by some ripening fruits and are effective against western yellowjackets, less so the common or German yellowjacket. They are not effective, even if used in large numbers, at eliminating worker wasp activity in a given area. aerosol sprays (various brands)-Spot-treat nests when discovered.